Occasionally - rarely - it can be worth interviewing England cricketers who are not Kevin Pietersen. Richard Hobson's piece with Andrew Strauss in the Times today yielded a nugget: 'He thinks he knows nine of the eleven he would like for the first [Ashes] Test at Cardiff, declining to identify the two vacant places'. Who are the Strauss Two? Acknowledging the wishes of the captain by keeping this item blind, OAS will be one, music to the ears of IRB, RSB and of course MPV. But IRB is one of three dumped by Strauss so far, with MSP and SJH. So the news that either the spinner's spot or the third seamer is settled [do the math, as the kids say] is bad news for one or the other. Which could it be? Strauss would offer only coded clues: 'We must acknowledge that an Ashes series is different to others. I am thinking of the extra attention, expectation, pressure, and the brand of cricket Australia play. We cannot afford for any of our players to be surprised by the challenge'. Given that SJH is constantly surprised by everything that ever happens to him ['I need to sit down and have a chat with Straussy, find out where I stand' etc] and MSP subsides into Bambi-eyed shock every time a batsman gets after him, it's still hard to tell. Maybe it's even a further incentive to that Pro Arch century-maker, who only ever looks surprised when he's bowled. 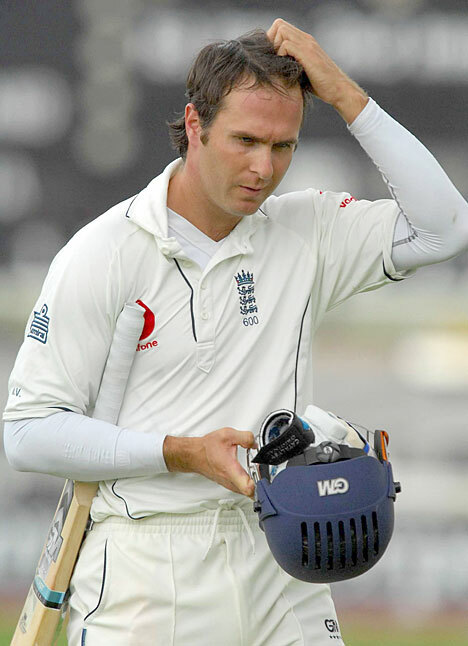 NB: One of Strauss's finest attributes is his refusal [so far] to refer to himself in interviews as 'Andrew Strauss'. So let's hope Andrew Strauss gets what Andrew Strauss wants. Reality, n. what is real; the state of things as they actually exist. Ten minutes before the 3rd ODI between West Indies and England. Sky Sports transmit a new interview with Ravi Bopara, conducted by Nasser Hussain. Nasser Hussain: 'Fidel Edwards has bowled some terrific spells'. Ravi Bopara: 'Yeah, his short ball is ten yards quicker than his normal ball'. Fourth ball of the sixth over. Cricinfo commentary: 'Edwards to Bopara OUT. That's awful from Bopara. Quick and aggressive. Bopara tried to hook and it got big on him. The ball made its limp and feeble way to mid-on'. You see, you can tell them and tell them, but you can't do it for them... For Andy Flower and for England too, much now depends on Friday's final ODI. England win the match, and the series: They have come through a difficult winter with an ODI series win. They were narrowly defeated in the Tests following a fluke collapse that can be explained by the delayed shock of the Pietersen affair. They responded by coming within one and then two wickets of winning the next two matches. Andrew Strauss, the player of the winter, and Andy Flower have formed a strong bond and need time to develop their team. England lose the match, and the series: They have been beaten in all formats by a team they should have defeated. They have won only two games, one of them because of a clerical error. Strauss and Flower have failed to convince Kevin Pietersen, the team's premier batsman, and morale remains suspect. They are, essentially, a second choice captain and a second choice coach. Which way will it go? Depends how you look at it, really. Yesterday was a bad day for English sport. But today will be a good day, because today, something very special will happen. Just before 5.15pm GMT, England's footballers will remove their one-off 'Anthem Jackets'* and reveal the new kit that they will be wearing as they selflessly represent us. It's not just a kit though. Designed to give them a 'psychological advantage', it has 'been built from the inside out, bringing together an innovative design philosophy with classic English tailoring'. Oh there's more, too, much more. Responding the the FA's [perfectly understandable] 'anxiety for newness and something majestic', manufacturers Umbro have come up with a kit that is 'the critical pilot light for the entire company'. 'We also considered the state of our society and culture, and these are things as a designer you can't help but consider'. So true, so true. I'm not even a designer, and I'm considering them now, pal. Here's the kicker though. The inspiration for this top amongst tops came from Umbro's visit to the National Football Museum, where they saw the first ever England shirt. 'It had a knitted double diamond on it next to the crest but the diamond wasn't an Umbro logo because it dates back many years before Umbro was even founded. It's weird though, it's almost like the Umbro connection was written in the stars'. You understand now why today is such a good day for England, for all Englishmen and women. As opposed to yesterday, when England's ODI kit failed so badly in its mission to provide that 'psychological advantage'. The neologisms of cricket gear are but cave paintings compared to this. It's clear that the day a delegation from Umbro, Nike or whoever enter the Lord's museum and stare at something pulled on by WG before responding to the ECB's 'anxiety for newness and something majestic' is the day a little part of our souls die, my friends. * Anthem jackets: 'A very pure garment. The badge on it is tonal'. Didn't you just know it? Harold Pinter called cricket 'God's greatest creation'. The Nobel laureate had no problem denouncing governments and rubbishing prime ministers and presidents with a few well-placed f-words, but he was too shy to meet Len Hutton, his all-time hero. Above his writing desk he had a portrait of himself batting in the nets, given to him by the cricket club he formed, the Gaieties. I didn't recognise Pinter in the painting, but I knew the net he was batting in instantly; it's as familiar to me as any house I've ever lived in. It's Gover's Cricket School, Wandsworth, and what's more, the stumps in the portrait are the wrong colour - they were grey not brown. Seeing that thick canvas net again brought everything about the place back. The stairs were so narrow you had to take your bag up longways. They opened out onto a snooker room and a small bar, both dimly, effortfully lit by yellowing bulbs, the changing rooms tucked behind, smelling of leather and Deep Heat. Entry to the nets was up another thin, dark corridor, a walk you'd make for the first time with plenty of butterflies in the stomach, for the four narrow lanes behind the canvas doorway had hosted - and still did - some of the greatest players in the game, from Andy Sandham and Alf Gover, who'd founded the school, to Viv Richards, Andy Roberts, Barry Richards, Garry Sobers, Frank Tyson, Ian Bishop; even, way after I'd last left the place, Brian Lara. The nets themselves were no more than 18 yards long. Bowlers might get five strides in if they were lucky. The building was an old garage with no electricity supply, lit with gas lamps that smelled damp and eggy, especially first thing in the morning. There was no heating. The temperature lifted only incrementally. The mats were made of some indeterminate kind of vinyl of the sort I've not seen before or since, but they were quick and true. The ball could thud into the canvas behind with the sound of a carpet being beaten. The place was steeped in cricket, it surrounded you, almost holy. Amongst it all was Alf himself, in his seventies by then. I must have seen him hundreds of times and he was always dressed identically: immaculate cream flannels, a white cravat under his stiff collar, hair swept nobly back and, most impressively, his England sweater, three lions in its centre, now so long it almost reached his knees. Sometimes, in his office, which was behind the snooker room, he would wear a blue England blazer, too. It was tradition that anyone's first lesson at the school would be with Alf, and occasionally after that too. Being young and full of piss and vinegar, I didn't really like 'getting Alf' as it was known. He bowled little round-arm dobbers, and often called the ball he was going to bowl: 'one to drive...' It all seemed so... gentle. What I know now of course is that the arm was round from an epic career of 1,555 first class wickets at 23.63. I wish I'd relished it more, enjoyed the moment more, but I didn't. I didn't like 'getting Alf'. My coach for several years was, in complete contrast, an Australian named Jim Cameron. Jim was a buccaneering, quixotic figure, red-headed and bearded, fiery and wise. He'd spent so many hours bowling, he could do almost anything from peppering you with a new ball to all kinds of weird, wristy spins. He was usually in the company of impossibly glamorous women who seemed to be in his thrall and he often looked like he'd been up all night, which he probably had. Jim taught me how to bat, properly bat, and he toughened me up. There were no helmets then, and no health and safety either, not that Jim would have taken much notice of either. Jim was often behind the bar serving drinks too. All kinds of people met in that bar. I never saw Harold Pinter, but Timothy West, the actor, took his son along; Monty Lynch used the nets in the winter, pounding ball after ball; Jim and the other Australian coaches brought in all sorts, most of whom engaged in long snooker matches on Alf's pay-as-you-go table; Alf would, very occasionally and if the bar was quiet, tell some stories, too. I remember one about the time he was night-watchman at the Oval for Surrey, and somehow - he was a proper number eleven - survived long into the next morning, until his partner walked down the wicket and told him it was about time he got out. His partner was Percy Fender. His captain was Douglas Jardine. Alf once opened the bowling for MCC in India, and, in the grip of the dreaded belly, simply ran past the stumps without delivering the ball, straight up the pavilion steps and into the toilet. 'Lost by a few yards,' he used to say. I went for probably five or six winters. Everyone could - there was no hierarchy, just the need to go into Alf's office and pay the bill. He'd let anyone he knew hang around and bowl, or just hang around. Every saturday, a guy called Joe would come in for a net. It was usually booked for the end of the day, and I'd often bowl to him, as Jim's arm would be losing its edge. Joe didn't mind. He'd have been drinking brown ale in the bar since lunchtime, so he wasn't that bothered about what came down at him. I used to wonder what Joe was doing at Gover's, why he came; it wasn't until some years later that I realised he was alone and just needed somewhere to go. Gover's was his place. One winter, my mate Simon, who was one of the coaches by then, discovered it was Joe's birthday, and organised a whip-round. We got him a little trophy of a batsman and had it inscribed, and a silver tankard for his brown ale. After his net, all of the coaches, Alf's son John who ran the shop downstairs, even Alf, fresh from the office, crept into the bar and gave them to him. It was the first time I'd ever seen a man cry. Alf himself died in 2001, aged 93. Sleep well, and thank you. More sala.... Hang on. Rewind there just a little. 'Now that I'm concentrating on my bowling...'? Here is some news, from the man who last season allegedly regarded himself as 'a batting all-rounder'. For Fred - batting averages over his last five Test series 15.66, 28.22, 28.55, 28.00, 16.75 - it looks like reality bites at last. NB: As is the way with these things, Flintoff was interviewed on behalf of his new batmaker Puma. They will no doubt be pleased by the news. Is there nothing He cannot do? Hear that? The unmistakable sound of an engine starting up. The engine of the Michael Vaughan bandwagon, that is. Everyone knows that Michael's been hitting it nicely in the nets. Goes without saying. But now he's hitting it nicely over in Abu Dhabi, too, where the previously underestimated Pro Arch trophy has assumed its rightful status as the series that will decide the fate of the Ashes. On the hallowed turf of the Zayed Cricket stadium, MP Vaughan of Michael Vaughan's Yorkshire took 115 from the Surrey attack, a century that's got everyone talking. Woah! Sorry, drifted off into an MPV-inspired reverie there. He's back! And he's hitt... well, you know the score. The old girl might be the aforementioned 132 years old, but she's still got it. What a glorious day's Test cricket in Hamilton, the kind of day only Test match cricket can give you. At green and hazy Seddon Park, Jesse Ryder stared into the abyss. Two short of the maiden Test hundred that will have occupied much of his waking and dreaming life, New Zealand nine down, Chris Martin walking in, Harbhajan Singh, right arm over, five to come. Chris Martin: Innings 65, runs 72, ducks 23, balls faced 388, average length of innings 5.96 balls. Everything coming down to the .96. Now that's what Test cricket is about; the drama within the drama. Martin did it, and so did Jesse. It's debatable who actually batted better, given their respective abilities. Martin's career with the bat is ascending towards the epic. His highest score of 12* represents a sixth of his total runs, compiled over another 64 innings. As a percentage it must be some kind of unbeatable record. He will probably retire as the worst batsman every to play Test cricket. Sadly he won't play enough one dayers to challenge the most heroic of careers there, the statistically unstoppable GD McGrath. McGrath went through 27 one day series without scoring a run, including the entire calendar year of 2004. That beat his own record of 2001, when he made one in 18 games. He hit an average of one four every two years. He retired with 115 runs, less than a third of his 381 wickets. McGrath didn't quite do the double: in tests his 641 runs finally exceeded his 563 wickets, although the wickets were ahead for a long while. Martin probably has enough Test wickets - 146 - to beat that already. At his current average of 2.17, he'll require another 40-odd innings to get close. Stats like those and days like these: 132 years old, indomitable and unbeatable. Andrew Strauss's kit was 'lost' (read: 'we had absolutely no idea he'd ever play another T20') and so he wore Matt Prior's. Right shirt, wrong player. Expediency, as ever, rules. Strauss is, technically, England's fourth T20 captain in 18 games, although the sequence is illuminating: From the first match in 2005 (glorious, glowing herald of the Ashes that it became), it runs Vaughan, Strauss, Strauss, Vaughan, Collingwood (for the next 10 games), Pietersen, Pietersen, Pietersen, Strauss. Forty-three players have represented England in those 18 matches. Twelve of those have played only once, eight twice, seven three times, four four times and two five times. Only eight players have appeared in more than half the games. Amongst the forty-three are six wicketkeepers - Jones, Nixon, Read, Mustard, Prior and Davies - and 14 opening batsmen - Trescothick, Jones, Strauss, Bell, Joyce, Vaughan, Cook, Prior, Maddy, Wright, Solanki, Mustard, Davies and Bopara - who have appeared in twelve separate combinations. The longest-running was between Bell and Prior, which lasted three games. England began the match in Trinidad with Bopara and Davies, neither of whom had opened for England before. Of the 18 T20 matches that England have played, they've won eight and lost 10, but three of the wins came against Middlesex, Trinidad and Tobago and Zimbabwe. Now there will be more upheaval as it becomes apparent that they can't carry Strauss. No-one needs a Brearley in T20. One man yet to appear alongside storied T20 names like Schofield, Dalrymple, Lewis, Trott, Batty, Yardy, Strauss, Snape, Cook etc: Graham Napier (highest score 152, career strike rate 154.72, total sixes 37, best bowling 4/10, economy rate 7.09, ave. 19.07). Late last summer, via a couple of fortunate coincidences, I had a net at Loughborough. It was at the indoor school (perhaps it was even the very same net where Michael Vaughan and Ian Bell often find themselves hitting it really well). There's enough room there for most bowlers to come in off a full run, and for a wicket-keeper to stand back behind the stumps. With all of the individual lanes opened up, it's almost like batting in the middle. A box of new white balls arrived from somewhere, and a couple of young quicks came in for two or three sharp overs. The mat was a fast one, with plenty of bounce. From back of a length they got the ball up at throat height with ease. They had a good time doing it, too, especially when one of them whipped a short, sharp ball onto the grill of my helmet via an ill-advised, gloved hook. Oh yeah, and both of the bowlers were women, in fact the same two who opened the bowling for England against Pakistan in Sydney yesterday, Katherine Brunt and Anya Shrubsole. Like most men who've watched women's cricket on TV, I'd wondered exactly how good they were, sometimes disparagingly. Well that day, I found out. They're good. In terms of pace, they were bowling in the mid to high 70mphs, which is pretty much what you'd face in a decent first XI club match: the real difference was in their groove. Professionals just get it right much more often. In the nets they bowled nothing loose at all, they were at you every ball and it all came with the ease and severity of natural talent. NB: Jrod's excellent piece at TWC makes the point. At last. After just the 2,824 ODIs, something interesting from the post-match presentation. Simon Doull asked Virender Sehwag how much his bats weighed. Give that man a coconut. Sehwag misheard at first, but then revealed that they're 12oo grams. I didn't know that subcontinental players used grams. It's kind of poetic. Reaching for the converter, that's 2lbs 10.32 oz. It's the .32 that makes all the difference. His career strike rate is now 101.66 over 199 innings. He wouldn't get in the England squad of course. His BMI is all a bit Samit Patel for that. You need to be fit in this game, like Ian Bell. 'Anyone who doesn't enjoy fielding doesn't enjoy the game,' said one of the commentators on the Australia-South Africa match the other other day. Oh yeah? Really? So, there you have it. What time is lunch? What time is tea? Here lies the truth about fielding if you're not a bowler and you don't hang out at first slip all afternoon. Anyone who's ever played can relate to it. It may not be PC to say it around the coach - in front of that lot, you must affect some kind of demented love for standing at mid-on - but there it is, right from the top. You've always known it though, haven't you? Many years ago, there was a tremendous TV drama called Bodyline. Its highpoints came every time the actor playing Jardine (I can't remember who it was, but he was very good) turned to camera and uttered the words 'Harild... Lig theory...' This was the cue for Larwood to do his stuff. We have waited some time for a modern equivalent, but we have it at last: the - very televisual - T-sign that indicates a referral by either batting or fielding team. Now, in this life, Dave Pelzer has been abused. The offshore tax laws have been abused. The memory of Elvis has been abused. But none of them have been abused like the referral system has been abused. A technological innovation designed to protect the integrity of decision-making - and by extension, the integrity of the game - has instead brought out the worst in players, umpires and commentators. Truth can be relied upon to be stranger than fiction, and the storyline it has developed for the test in Trinidad stays true to type. To chart its course, from Tiffin's first innings hide-behind-the-sofa bloopers to the vicious, mind-blowing inconsistencies of the Chanderpaul and Cook decisions of day four, is to read a map of the idiocies of an irredeemably flawed system. The heart of this flaw is the concept that the players refer an umpire's decision. This politicises decision-making; it turns technology from a problem solver into a tactical device. It is essentially inequitable. England (naturally) provided a classic example. Having used their referrals up, they were unable to overturn a horrendous not out decision in favour of Brendan Nash proffered by Russell Tiffin. Had England been removed from what they no doubt felt was an obligation to contest a couple of early calls by Tiffin in West Indies' first innings, and had Tiffin been relieved of the pressure applied to him by an angry and impotent England, the correct decision could have been made. The solution is simple: remove the obligation to refer from the players, and allow the umpires to confer freely, and as often as they like. The interviews at the close of play today were enlightening. Asked his opinion on the bizarre over-rule on a caught behind that allowed him to complete a century, Shiv Chanderpaul muttered 'no comment'. And asked how much time England might need to bowl out West Indies a second time, Graeme Swann replied, 'about 300 overs'. Neither was joking. Everyone, from frustrated players to livid punters, were abused today, and it wasn't pretty. 'Andy Flower told me I was being left out because I wasn't bowling quick enough nor was I hostile enough for what they wanted. I was bitterly disappointed. It was not the right time to take it up with Andrew Strauss, but when we get to Trinidad I want to sit down with him over a beer or over a meal and see where we stand'. What part of 'you're not bowling quick enough, or hostile enough' does Steve Harmison not understand, then? It is, after all, one of the more direct pieces of criticism - sorry, feedback - a fast bowler can be given. And has it not yet struck him as odd that, even when he's in the team, he doesn't usually get the new ball? Does he not wonder, when he throws up after a couple of overs because it's hot, how fit he actually is? Perhaps he can ask one of England's many analysts to help him read between the lines of Andy Flower's other comments: 'Fast bowling is long, hard work and at the age of 30 it is only going to get harder work, so it is up to Steve really. If hard work is just a base that you start with, then that is what he's doing at the moment, but for you to be a successful international cricketer you have to be very hungry. Only he knows how hungry he is to carry on the hard yakka of a fast bowler's life'. Inside the Harmi bubble, a 'beer' or a 'meal' with Andrew Strauss might bring understanding. The rest of us have already heard it loud and clear, Steve. NB: Andy Flower, laying it down in plain English. Refreshing. It was good and necessary to find these two pieces in the papers today, one by Michael Atherton and the other by Gideon Haigh. Both focus on the meaning of Pakistan to cricket. Athers can probably be forgiven a few loose sentences at the top ('they break the laws at will' - do they? And who are 'they'? Some of them? All of them?) because his piece has heart. Gideon Haigh's, as usual, has brains as well. It feels like more than 24 hours since England and West Indies walked off the field, laughing and joking with each other in the Barbados sun, but that's all it is. At first it seemed like an incredible, boy's own escape: rocket launchers fired and missed; a grenade rolled under the bus that failed to explode; some players with shrapnel wounds but safe in their dressing room; even the irrepressible Dominic Cork somehow at the centre of it all, on the phone to the BBC. Then the pictures of the policemen dead in the road; the news that their families would have to face; Chris Broad giving an interview covered in the blood of a fellow umpire, explaining how he'd seen their driver shot dead in front of them. Brave men had given up their lives. It wasn't an escape after all. At the Flyslip, Damith said, 'It felt like someone I knew was in the middle of this. We live the game, so much so that the players are like part of our family', and he's right. They become so familiar, we feel as if we know them (is their a single England fan who, at the moment, doesn't feel like he's spent a few days in the pub with the estimable Ronnie Sarwan?). Cricket lovers in cricket-crazy Pakistan have the feeling too. It seems important to recognise that, because the fundamental principal of the game is that everyone can play. That will inevitably and necessarily be mitigated by the dangers inherent in Pakistan, but it is not merely their problem. Australia stayed in England after the 7-7 attacks in 2005. England returned to India after Mumbai. The reason was a principal: that this is a conflict not between nations but between ideologies. It has no geographical boundaries. We stand against it together. That principal must hold for the weakest as well as the strongest. Pakistan might not host cricket, but they can and should play cricket. In a comment over at Nesta's blog, Tooting Trumpet wrote: 'our best defence is to inculcate an understanding of the value of human life' and that's true. It might be generations away, but it can start, and it can start with cricket. I've not been blogging long, but it was the first place I went, because community is there. No-one had escaped what had happened, because, in varying degrees, it happened to us all. From here, it feels like we can start. At close of play on 2 March, 9,789 Test runs have been scored since 1 January, at an average of 44.29 per wicket. A cursory check reveals that, of late, 2006 had more runs by this date - 12,577 - but from 25 per cent more matches, at an average per wicket of 38.22. We've had single innings totals of 765, 749, 644, 606, 600 and 566. We've had Younus Khan's 313, Sarwan's 291, Jayawardene's 240, Samaraweera's 231 and 214. We've had 22 individual Test hundreds. Cook, Sarwan, Pietersen, Collingwood and Kapugadera have all got out in the 90s, and don't even mention Mitchell Johnson. Sarwan requires just eight more runs to exceed his total output for 2008. He's had four innings.